If learning isn’t fun, your child isn’t going to learn. It’s just as simple as that. What child doesn’t love playing games on the computer or tablet? They can learn while they play with elementary maths games from TurtleDiary.com. Math Story is a game that’s based on counting exercises. It’s picture based, and kids get to choose from a range of activities. They’ll solve simple math problems, while they build their counting skills. With Symmetry, kids connect the dots to create symmetrical shapes. It develops motor skills, improves concentration, and helps them build a strong mathematical foundation that will stand them in good stead in the later grades. Shape Inlay is a cool math game that teaches kids about shapes – squares, rectangles, triangles and pentagons. They move shapes around, and get a foundation in geometry. With Space Transformation, kids learn about reflection, rotation and translation. Again, the focus is on developing geometric skills. Kids who play Table Memory will learn all about multiplication – they just flip the cards to make pairs, and they can practice their multiplication skills over and over. It’s engrossing, enjoyable, and you might even want to play along! Number Addition Chart is a game that encourages kids to find the right number on a colorful chart by adding numbers together. When kids play this game, they’ll not only learn math skills, they’ll develop a better attention span and enhance their memory skills. Now, let them click and drag numbers on a grid with Magic Square Addition. It’s fun and challenging! You can use these games along with our printer-friendly worksheets that can be used over and over to help your kid build the skills that he or she will need in the higher grades. Often, good teaching aids make the difference between success and failure, so give your kid the TurtleDairy.com advantage. 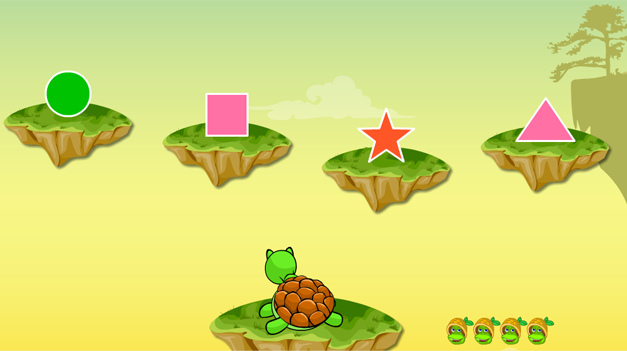 "Turtlediary.com" offers 1000+ online educational games, videos, and numerous printable worksheets. Our games impart knowledge and focus on skills that are useful for kids at and every step of the learning process. Children learn faster through fun-packed games and videos, and this is what Turtlediary believes and trusts in. Have Trouble Learning Pronouns? Try Interactive Pronoun Games! ← Previous Post: How Are Online Games Helpful for Easy Learning?